On January 6, 2019 local time, President Macky Sall of Senegal met with State Councilor and Foreign Minister Wang Yi at the presidential palace in Dakar. Macky Sall asked Wang Yi to convey his warm greetings and sincere wishes to President Xi Jinping. Macky Sall also expressed his warm congratulations on the successful landing of China's lunar probe on the far side of the moon. Macky Sall said that this major breakthrough speaks volumes for China's leading position in the field of scientific and technological innovation in the world. African friends are proud of and happy about this and hope to strengthen cooperation with China in the field of scientific and technological innovation. Wang Yi said that China's achievements are also achievements of developing countries who have the rights and also the capabilities to achieve rapid development in scientific and technological innovation, and that China is willing to cooperate with African friends in this regard. 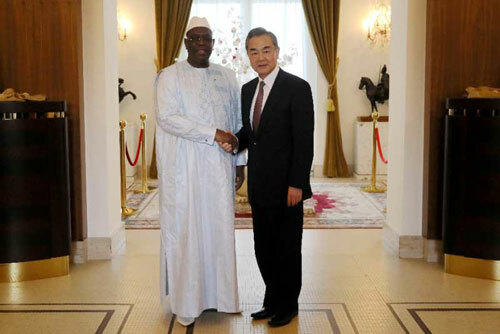 Macky Sall said that the people of Senegal still vividly remember President Xi Jinping's visit to Senegal last year. Under the support and guidance of President Xi Jinping, the Senegal-China relations are dynamic, practical and effective, which can be regarded as a model. The highways and wrestling rings in Senegal built by China have become a symbol of friendship between the two countries. The Senegalese side appreciates China's support for and assistance to Senegal's economic and social development and hopes to further deepen cooperation with China in various fields. Macky Sall said that the Chinese side's successful hosting of the Beijing Summit of the Forum on China-Africa Cooperation (FOCAC) reflected the strategic vision in developing Africa-China relations. For those who discredit Africa-China cooperation, African friends know well in their hearts who their true friends are. Over the years, the Chinese side respects Africa's independence, sovereignty and culture, sincerely supports Africa's development, and adheres to multilateralism on the international stage to safeguard the interests of developing countries. China and Africa are enjoying the relations featuring mutual respect, mutual benefit and win-win results and joint progress. The Senegalese side is committed to deepening the comprehensive strategic partnership with China and supporting China's legitimate position in the international arena, and is willing to work together with the Chinese side to push the implementation of the outcomes of the FOCAC Beijing Summit. Wang Yi conveyed President Xi Jinping's sincere greetings to Macky Sall. Wang Yi said that President Xi Jinping's successful historic visit to Senegal last year injected strong impetus into the development of China-Senegal relations. I visit Senegal at the beginning of the new year, and am willing to work with the Senegalese side to earnestly implement the important consensus reached by President Xi Jinping and you and promote the implementation of the outcomes of the FOCAC Beijing Summit. The Chinese side appreciates the Senegalese side for adhering to the one-China principle. The solid political mutual trust between China and Senegal has laid a solid foundation for bilateral high-quality cooperation in various fields. The Senegalese side is currently implementing the second "five-year plan" and vigorously promoting industrialization. 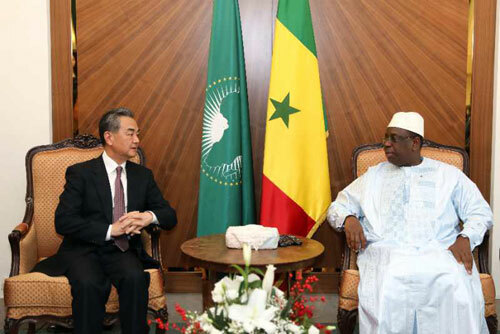 The Chinese side is willing to be an enduring and reliable partner of Senegal in this process. Wang Yi said that China-Africa cooperation is South-South cooperation, and mutual help between developing countries. The Chinese side will continue to support the development of African countries within its capacity in accordance with the will and needs of the African side. As co-chairs of the FOCAC, China and Senegal should closely cooperate and actively coordinate with each other so as to jointly promote the implementation of the outcomes of the Beijing Summit, speed up the integration between the Belt and Road Initiative and the eight major initiatives with the Agenda 2063 of the African Union as well as the development plans of various African countries, thus building an even closer China-Africa community with a shared future.